RealTime Gaming is an online casino software developer with an interesting and questionable history. While these games are hard to find online, we explain a little bit more about this gaming studio and the pokies available in the RTG portfolio. RealTime Gaming (RTG) has been in operation since 1998. The brand started out developing downloadable casino software in Atlanta, Georgia, but as online gambling laws in the USA tightened, RTG moved its operations to Costa Rica. In 2007, the company was acquired by Hastings International, a company operating under corporate services provider, HBM Group. RealTime Gaming attributes its ongoing success to its team of seriously talented people who have a deep understanding and passion for the gaming business. The brand is committed to innovation in order to stay at the cutting edge of the online gaming industry. RTG has had its fair share of controversy over the years, starting back in 2004 when a player won $1.3 million playing its Caribbean 21 blackjack game at an online venue called Hamptons Casino. The huge win came from a $1,000 deposit, which would have merely seemed like a force of good luck, except that the same player also won close to $100,000 playing at another casino at the same time. The player was accused of cheating, with the hosting casino claiming he was using an automated playing program and refusing his payout. The incident was eventually settled offline for an unknown amount, but resulted in RealTime Gaming changing its maximum bet size to $5.00. Many online casinos hosting RealTime games have come under criticism, with some of these sites being blacklisted by online gaming authorities. One of RealTime’s largest casino operators, the Crystal Palace group, was subject to numerous complaints and dodgy accusations before its owner Warren Cloud passed away suddenly on his boat in Ibiza in 2008, leaving many players at his casinos without access to their money. RealTime’s major focus is on the pokies, with a large collection of vibrant games under its belt. RTG does offer a progressive jackpot network, although some online casino reports have said the growth rate is quite slow as the titles aren’t as popular as big name progressives from Microgaming or Playtech, and the jackpots are rarely won. With all maximum bets capped at $5.00, RealTime’s pokies are well suited to players with smaller bankrolls. 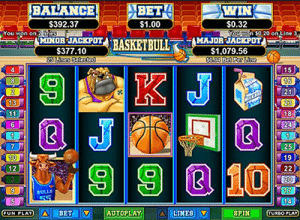 Basketbull – This five-reel 25 payline pokies game uses a creative theme consisting of a bunch of sports obsessed animals enjoying a stadium game of basketball. The game features wild symbols, scatter symbols and a fun free spins bonus that includes free throws where you get the chance to throw a ball through the hoop for your chance to triple your wins. Aladdin’s Wishes – Offering a progressive jackpot with affordable low bets, Aladdin’s Wishes is a five-reel 20 payline pokies game featuring wilds, scatters and a mini bonus game. Triggered by an appearance of three or more of the magic lamp symbols, the bonus game gives you the chance to select between three and five lamps to reveal multiplier prizes of between X2 and X100. 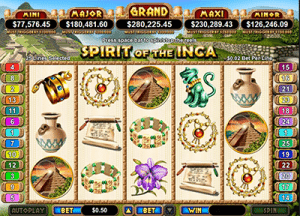 Spirit of the Inca – This five-reel, 25 payline progressive jackpot pokies game offers wilds and scatters and can award as high as 75 free spins. The five-tiered progressive jackpot can only be triggered when the maximum bet is in place, and is triggered at random after any winning or non-winning spin. The free spins bonus also gives you the chance to activate higher multipliers and additional perks during free spins. While RTG’s focus is clearly on the pokies, the brand also offers a handful of other casino games – a rather odd selection, in fact. From what we can tell, the only non-pokies games you’ll find from Realtime are European Roulette, French Roulette, Bingo and Keno, although RTG does claim to offer over 300 casino games including video poker and table games, with new games released monthly, but we were unable to find any further information on any of these on Realtime’s website. Perhaps it’s a matter of region blocking, or maybe it’s the history of suspected rogue operations that has kept online casinos away from offering RealTime Gaming pokies, but either way we were only to find a couple of recommended casinos that offer RTG games – you’ll find trusted sites listed in our casino table above. If you want more variety, stick with the big name, trusted software providers like Microgaming, NetEnt, Playtech, BetSoft, Quickspin, Play’n Go and more, which offer hundreds of exciting pokies at the most reputable online casinos.